... is that it's such a good dose of colour therapy. Wow! I'm interested to see what these awesome colourful patches are going to turn into. Looks very cool! 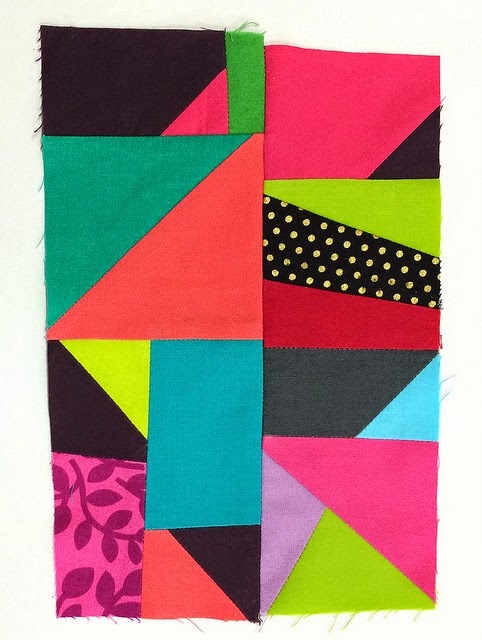 Great splashes of colour, Rachael! Where will they end up I wonder? Another amazing quilt no doubt. 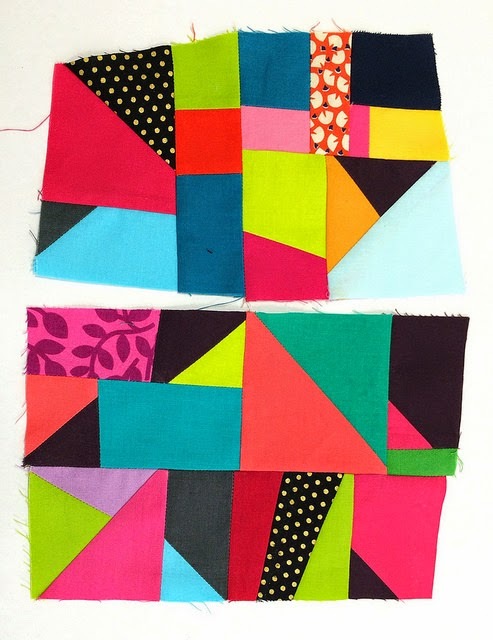 I think the excitement of putting colours together is what draws me to sewing and quilting. 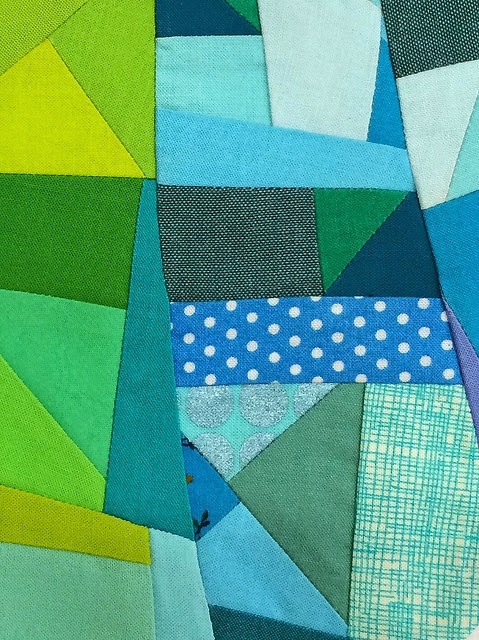 My cousin who is an artist commented that quilting is my art form as he knows I can't draw to save my life. I think he is right. I "draw" with coloured fabrics and get an enormous amount of pleasure from doing that. Great therapy too! Your post was a bright start to a very grey Northern Hemisphere Sunday morning. Thank you. Oh yes!!!!! For me its all about the colours. I would find it very hard to contain myself to one or two colours. Vedo alcune stoffe che abbiamo anche da questa parte del mondo...Bello! You certainly can't feel blue when you have that much colour around you. (Pardon the pun) I wonder what you are up to now? Amen to that ... and you certainly have some bright hues there to cheer you up. What an explosion of colour! They look great but my favourites are all the blues. Wonder where this will end up? Something wonderful and original no doubt Rachael. It's always colour at your place RAchael! Isn't it just! Are these to be new curtains or have you started a new quilt? I love them all! They are so vibrant and happy. I don't think I'll ever finish all my projects; I see these wonderful blogs and want to start making some of my own immediately!! And you are so good at putting them together! Very Nice! This looks like a lot of fun!! 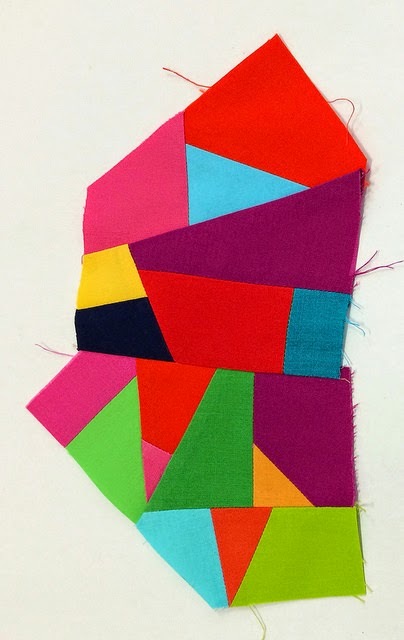 Must have been lots of fun picking all those colours together playing with fabric is the best. Can't wait to see what you end up doing with them all! That looks like a whole lot of fun!! 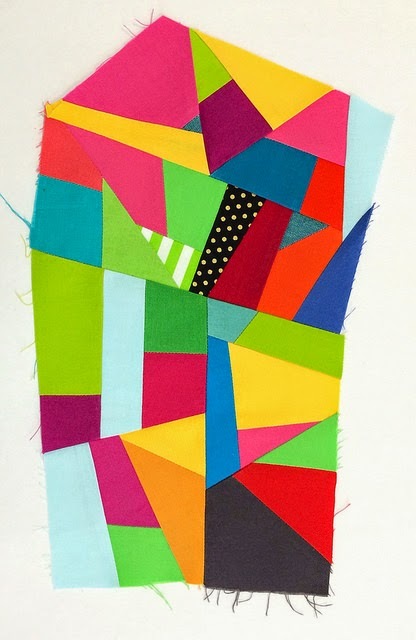 Isn't it just wonderful to pull out colors and just start sewing :-) Enjoy!! Please print this up as a fab poster! It indeed gave me some much needed color therapy today. So saturated and mutable. delicious shades! It is indeed, can't wait to see where these go! THIS is the sewing mood I'm in today too. FUN FUN FUN! It sure is! Love these patches! This is where my scraps are destined this year too. Love your patches! You make me want to dig into my scraps again. 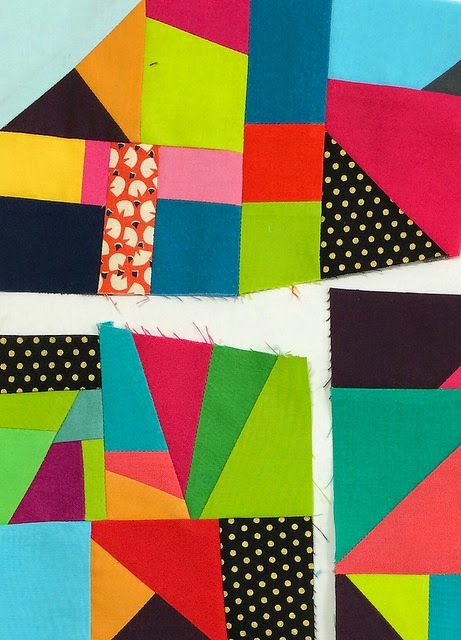 Love your string quilting! A goal I set for myself this year was to work more with scraps...your post here inspired me! Thanks! 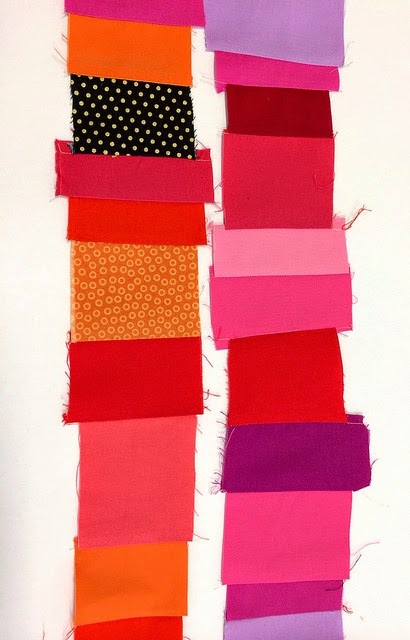 Mind if I refer to this post in my blog when I share my travels as "a non-scrappy quilter learns to use scraps"? 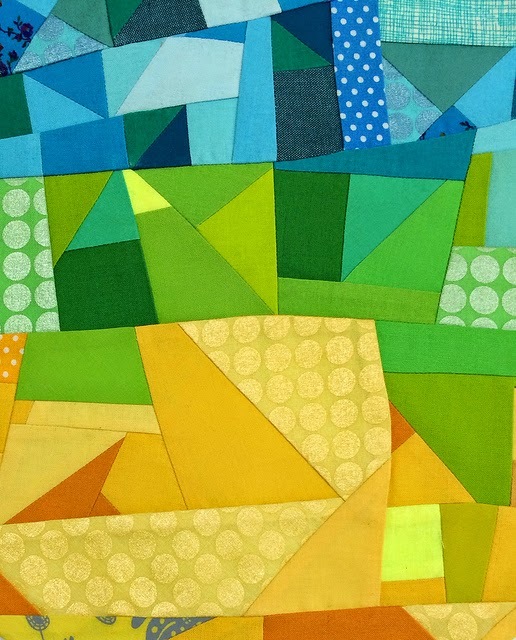 Is that the first quilt from sujata's book? Love the bright colors!!! Thanks for sharing all those wonderful blocks. Love the color inspirations in each! Love, love, love! Those little doses of print make it sing. Great fun! Your mind is indeed a colourful place. Will be watching as we all will be....no pressure....can you feel all our eyes boring into the computer screens.....no pressure......watching waiting......no pressure....are you finished yet! NO PRESSURE!!!!!!!!!! Well, that woke me up :) What a bold bunch! Brave is what you are. Ha ha ha...That is exactly the one thing I love about sewing too!!! awesome - love it ! 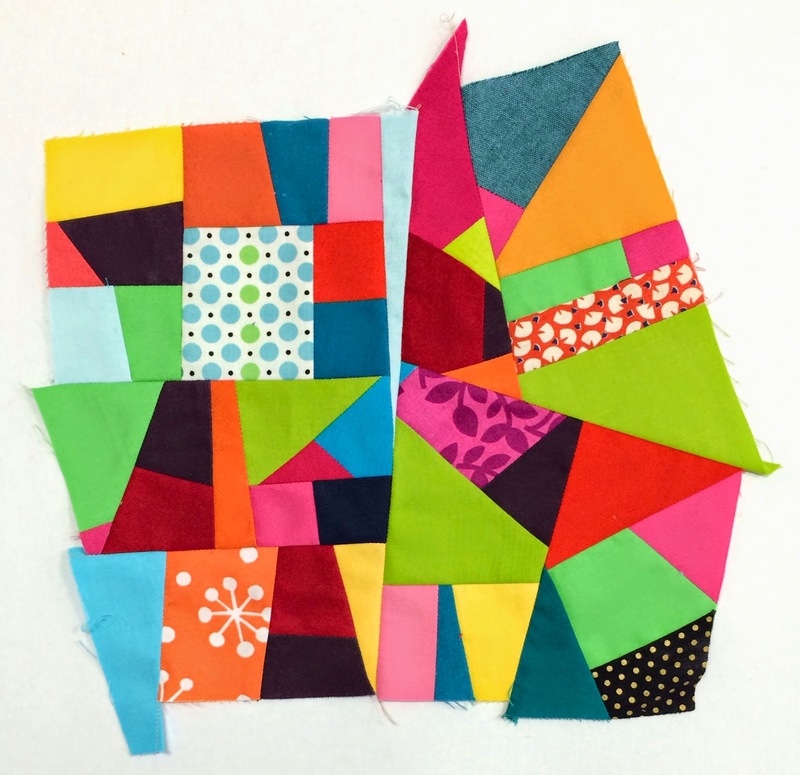 looks like fun piecing with all those fabulous colors. Love the sprinkling of a few prints. HAPPINESS!!!! that's what i see! 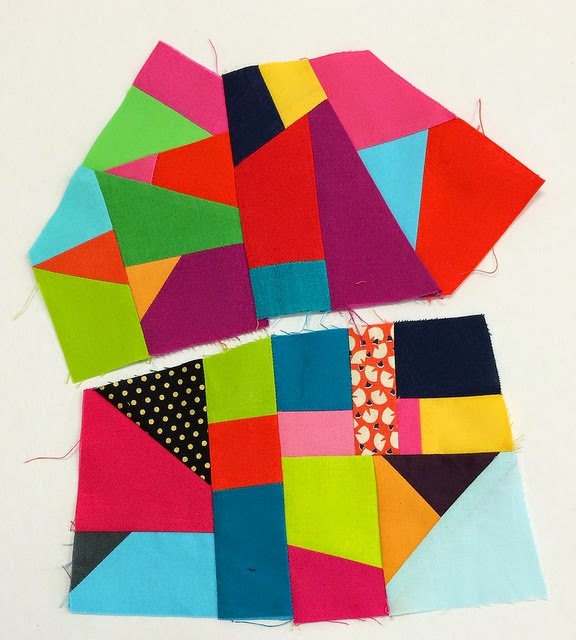 Nothing like the freedom of random piecing either! Like where you're going with what you've done so far. 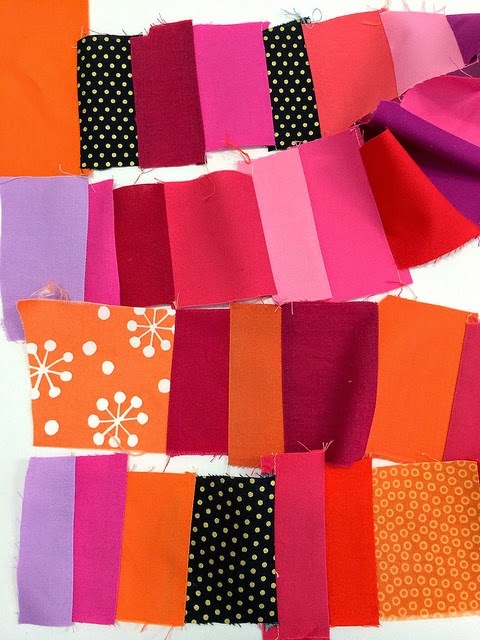 Your blog is a colourful place - I LOVE IT SO MUCH my dear friend! That's the kind of sewing I've been thinking about lately too ! Very fun! Love the color combo's especially those cool blues! Looks like very good therapy :) I am not always so good at just going with the flow. I will enjoy watching you go to it. Have you ever visited the blog " 15 Minutes Play"? Fun and amazing things created here. this is sooo much like the way I work! I often do this as an exercise to get my mojo back! wonderful colors! Agreed! Makes you feel good.